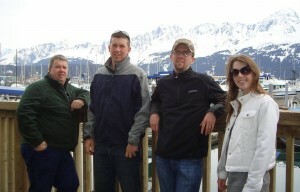 during a trip to Alaska. Wife Nanci took the picture. The family of John Russell invites the community to join them in celebrating his 35 years of public service to the Town of Webb Police Department and the Old Forge Fire Department at a gathering to be held at the Old Forge Fire Department on Saturday, January 3 at 7 p.m.
Russell, who retired as police chief on December 9, 2014, was hired as a Webb patrolman in October 1979, pending a civil service appointment. After attending the Mohawk Valley Police Acad-emy and passing the civil service exam, he was permanently appointed in October 1980. He served in the capacity of patrolman for 29 years prior to being appointed police chief at a Town of Webb board meeting on June 10, 2008. He officially took over duties as chief on January 3, 2009. Among his accomplishments as police chief, Russell worked with Herki-mer County Sheriff Christo-pher Farber in securing Homeland Security grants which provided funds for the purchase of equipment to enhance security capabilities of the Webb Police Department. In May 2011, a $4,500 grant allowed for the purchase of computer equipment that expanded information sharing between local, county, state and federal law enforcement agencies. The installation of a digital base station and the purchase of three portable digital radios in March 2013 were also made possible through a federal grant. As a life-long member of the Old Forge Fire Depart-ment, Russell served in many capacities as a volunteer fire fighter, as well as a nine-year stint as Fire Chief. He currently maintains his status as an active member. In his private life, he is on the board of MAC’s Safe Ride and is a member of the Masons. He enjoys the outdoors and continues to operate his 30-plus year business, John D. Russell Construction. Written by: Marianne Christy on January 1, 2015. Last revised by: Gina Greco, our reviewer, on January 8, 2015. This entry was posted in admin and tagged Chief Russell, retirement, Town of Webb Police on January 1, 2015 by Marianne Christy.